We are quite relaxed after the past few days as we have driven less than 130 kilometres in total. After breakfast, we go to Strahan and have a shower in the toilets by the waterfront. At 10:05 am we head off to Queenstown and although we were there yesterday, we have to travel through to get to our future destinations and there is more to see as we approach from the other direction. It is only 40 kilometres to Queenstown and it only takes 55 minutes. The road into the town has some amazing sights. The denuded hills are almost a Martian landscape. Queenstown was a major mining town for copper back in the late 1800s and early 1900s and the fumes from the copper smelter killed off all the vegetation. This led to very bad erosion. The vegetation is only now starting to recover, but I am pretty sure that the authorities are killing off any regrowth as the denuded landscape is now part of the physical attraction of Queenstown. I think that I agree with this, as strange as it seems. 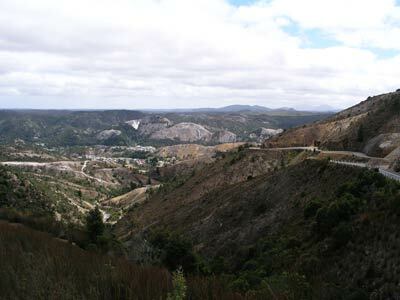 Compared to Strahan, Queenstown is a bit mangy looking, not just because of the dead hills. We go looking again for a saucepan but without luck. We also need to wash some clothes etc as it has been a week since we did any. We discover that the laundromat has closed and the only one is in the caravan park. There is a lookout almost in the centre of town called Spion Kopf Lookout and we go there and get a good view over the mine, town and of the surrounding hills. It also has an old cannon there that has an interesting story. We need some supplies so we go to one of the supermarkets. We then go to Penghana House which was built in 1898 for the first General Manager of the Mt Lyell Mining and Railway cCompany, the mine owners in Queenstown. It is a beautiful looking home on the hill to the west but as it is an operating bed and breakfast, we can only look at it from outside. Quite a nice looking building. We find the caravan park and what a shithouse place it is! Probably the worst caravan park I have ever seen. We sneak in and put on a load of washing (the most expensive of the trip). It is almost lunch time so we head back into town as we have decided we want to have a hamburger. We purchase food and head back to the caravan park. The washing is now finished so we put it in the dryer and eat our lunch. The dryer needs more time so we read a bit. Even after two runs through the dryer, the clothes are still very damp. I tell Kelly that there is no point doing again (even if I did have more change) as the dryer is crap, like the caravan park. We head off. At 1:25 pm we leave town and head east along the Lyell Highway. 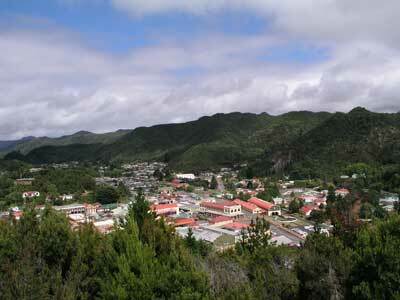 There is a very good lookout as you climb out of town that gives excellent views back over Queenstown. At the top of the hill, there is a road off the left that heads to the Iron Blow Open Cut mine. This was the original mine in the area, opened in 1893. The mine site is not much, but it is worth visiting as it gives good views of the current mine as well as the old mine town locations of Gormastown and Linda. A bit further on at Lake Burbury we go to have a look at the water. There is a bit of a camping spot here as well. We need some more firewood so we head down a track. There are more bee hives along here somewhere according to a sign but I find some good timber to cut. Kelly stays in the car while I collect it as there are bees all over the place. 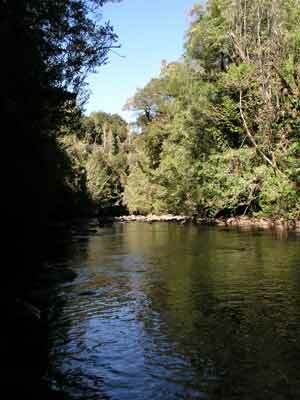 About 40 kilometres out of Queenstown we come to the Collingwood River. It is just after 3:00 pm. There are two small camping areas here, one either side of the river. We look at both and decide to stay the night at the western one which is flatter and larger. It also is further from the bee hives which are only about 100 metres from the other spot (what the hell do National Parks think letting aparists keep bees so close to recreational areas!!!). There is a toilet here but unless you search, you would not even know as it is hidden up an overgrown track. We are only metres from the river and the road. 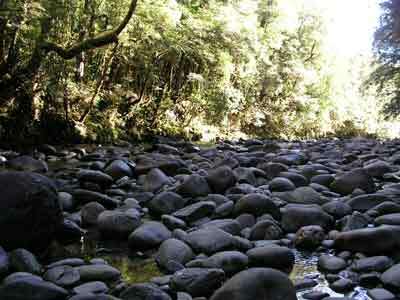 The river is quite nice and I collect some water so we can have a shower. 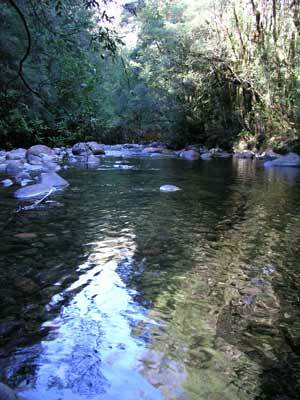 The Collingwood runs into the Franklin River a few kilometres downstream. I put up a rope between two trees and we hang our still damp washing from it. It will take well into the evening for it to dry. We will have a relaxing afternoon doing nothing but read a book. As it is Valentines Day, I plan to cook a special roast dinner so I get a good fire going. We have the roast beef with some good Australian sparkling wine. I later discover that you are not supposed to have fires in this national park. This is contrary to what is in the guide book we are using, there is no sign at the entrance to the camping area (where it tells you must pay $22 a day to stop here but offers no way to pay) and the National Parks web site says "at the Collingwood River, basic campsites, a pit toilet and fireplaces are available. There is no charge for camping." Anyway, we have a good fire and nice night. A few cars pass by but once it is dark (after 9:00 pm), there is only one car seen or heard at 2:45 am till about 6:20 am. We did not see a single animal here. We only have less than 50 kilometres to go today but I am up at 8:00 am. Kelly is up a bit later at 8:30 am. It was pretty cool last night and only 8ºC and today looks like being a great day already. We leave at 9:05 am and about 13 kilometres down the road we stop to look at the Franklin River. There is a nice toilet and picnic area on the eastern side of the bridge and the southern side of the road. Here there is also a nice walk to the edge of the river. The track then follows it for a short distance till you come to the intersection with another small river before it follows this for a bit and returns in a loop to the carpark. 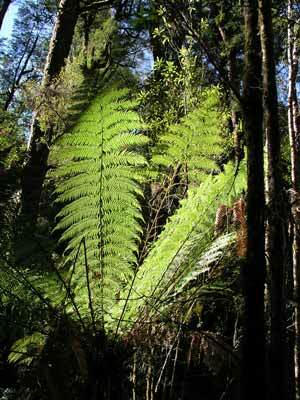 There are some great tree ferns and trees, well worth stopping and doing the walk. It is great to see this historic and wild river in its very young section. When we get back to the car it has warmed up to 15ºC and there is a tour bus from Port Macquarie here. They are all well over 60 years old and very friendly. We get the third degree from them about our travels, our car and even our hot shower. I have to open the bonnet and show them how it all works! They insist I have a cup of tea and cake with them. What a friendly bunch! At 10:15 am we are back on our way and less than 30 kilometres along we turn left at Derwent Bridge to Lake St Clair. Derwent Bridge is located where the highway crosses the River Derwent. 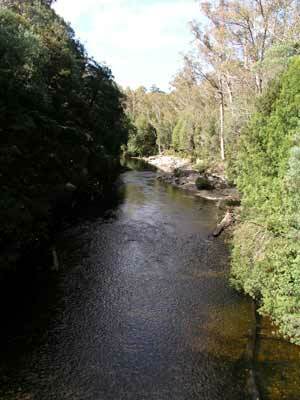 This is the main river in Tasmania and goes all the way to Hobart. Here the river is dammed above the highway to form Lake St Clair and below the highway is the top end of Lake King William which is formed by a dam at Butlers Gorge. There is not much at Derwent Bridge, a few accommodation options and from memory, a service station. Lake St Clair is the southern end of the World famous Cradle Mountain Walk. We are staying here tonight so we have planned to do a couple of walks. We arrive at the visitor centre at 10:50 am and get a brochure on the walks and find out where the camping area is located (we did not see any sign on the way in). There is a restaurant, cafe, toilets and souvenirs here. We then go and look at the camping area and decide that it is quite nice. We make a mistake in not parking the car here now on a spot as when we come back late in the afternoon, the best spots are gone. As Kelly pays for the camp site ($10 per person), I make lunch and set up the solar panel to keep the battery in good condition (since we have not done many kilometres over today and the previous three days). We had thought about doing the walk along the lake's edge. To do this you can catch a ferry to the far end of the lake and walk back. However, the cost is $25 each way, a bit too rich for my liking. We set off on the walk at 11:30 am. We are heading towards Mount Rufus. We are not doing this walk but the first bit heads that way. It is a hard slog for the first hour or so. It is through quite nice country but a bit later it gets boring. Finally we come to an intersection where there are two backpacker females and a couple. They are heading in the same direction as we are. We head off down towards Shadow Lake. We come to a sort of swamp where there is a boardwalk across. On the other side we stop and have lunch. Soon after this we come to Shadow Lake. This is very nice and the water is not too cold. The water overflowing out of the lake runs into a small river and then down into Lake St Clair near the end of the walk. The last bit of the walk is downhill and quite easy. The vegetation varies and is sometimes very nice and at other times not exciting. The whole walk appears to be about 10 kilometres and it takes us just over four hours to get back to the lake. 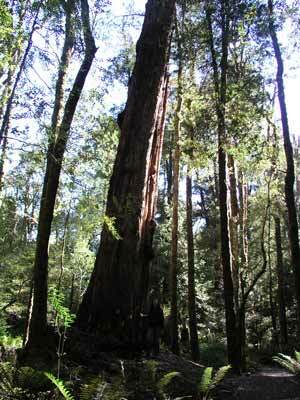 Here we do a walk called Platypus Bay Track. 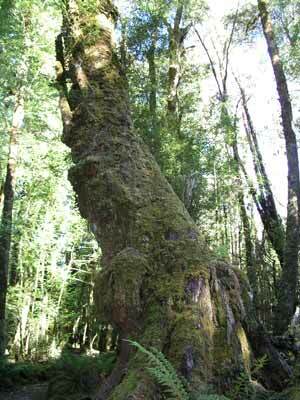 This goes along the edge of the lake to a spot where at sunset or sunrise you are said to be able to see platypus. We do the loop and end up eventually back at the visitor centre at 4:30 pm. This almost five hour walk has not been as exciting as I thought it may be, but it was nice nonetheless. As we put our things back into the car, I pick up the backpack and the camera (my Olympus C5050) falls out of the unzipped back section. It hits the ground with a loud bang. 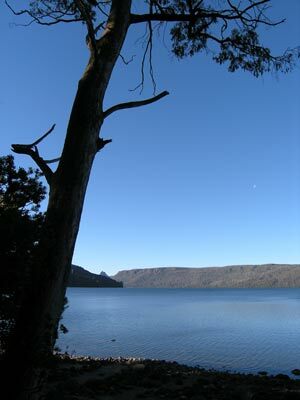 The camping area is located right on the edge of the lake which is at 737 metres. It is pretty large and there are a lot of sites overlooking the water. As I mentioned, all the best spots are taken (except one which a caravan driver is trying, very badly, to get his van into). We think he has given up and is going to go to a different spot but his wife stays on the site and we assume that he is going around the loop road to try from the other direction. We end up finding a flat spot on the top of the hill in the middle of the road that loops around the camping area. 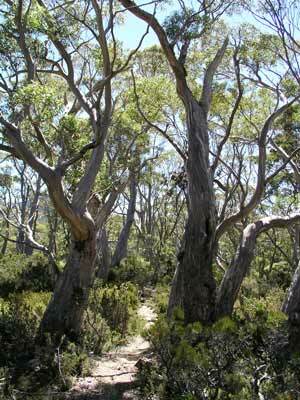 It is still quite nice, with large gum trees all around. There is a toilet block in either direction and we set up camp. I examine the camera and find that when you take a photograph it comes up with a picture with stripey sections across the screen. It plays back old photos okay, but new ones are not so good. I also noticed that they are out of focus. I fix this but it looks like it is stuffed. Fantastic! Luckily, we have Kelly's C5060 which is in the underwater housing. Looks like we will have to use that for the rest of the trip. We are all dirty after the walk so first priority is to have a shower. The showers need a token (which you get when you pay) and give you six minutes of hot water. Enough to clean us up. No fires are permitted here so we have a stirfry. When we have been in bed for about 30 minutes (just after finishing reading), the car moves a bit. Then it does it again. I get up to investigate and find two possums in the garbage carrier that I have strapped to our spare wheel. I scare them off and zip it up. Tonight it is very cold, only 1ºC according what I later read in a newspaper. However, it is still nice. We are up at 8:00 am and it is only 4.7ºC but sunny. Well, after a few easy days for driving, we now have a longer drive to Lake Pedder in the Southwest National Park. We head back to the Lyell Highway and continue east. We take a short cut before we get to Bronte Park and travel via a dirt road to just past Tarraleah. This is much shorter, but probably takes the same time as travelling on the highway. 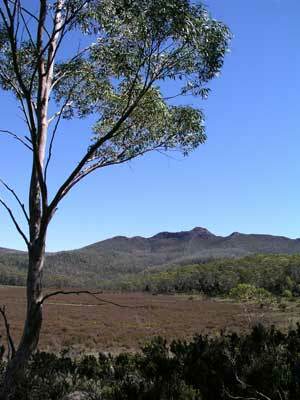 From here, the highway roughly follows the River Derwent for the next 150 kilometres or more. There are more lakes, Lake Catagunya, Lake Repulse and Meadowbank Lake. Past Tarraleah the terrain turns very dry. Some hills are very brown and bare looking. A few kilometres past Lawreny and about 40 kilometres from Tarraleah, we turn right onto a road that crosses the upper part of Meadowbank Lake. This goes via Ellendale to Westerway. This cuts a lot of kilometres off our trip. We stop at 10:50 am for morning tea at Meadowbank Lake and find a nice little camping area with a toilet. We are back on the road at 11:20 am. A short distance from this spot we see an echidna crossing the road. We stop and take some photographs. At Ellendale we see what looks like a castle. A few days later we see another one and I deduce that they are some sort of local design for an old barn. There is also a nice picnic area in this town. At Westerway we turn right and head west. 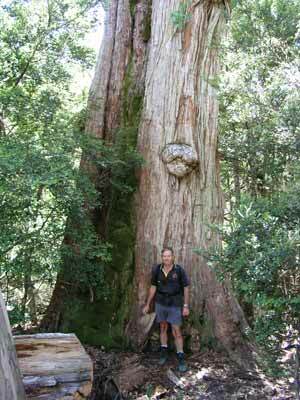 It is about 51 kilometres from Westerway to the turnoff to Lake Pedder. 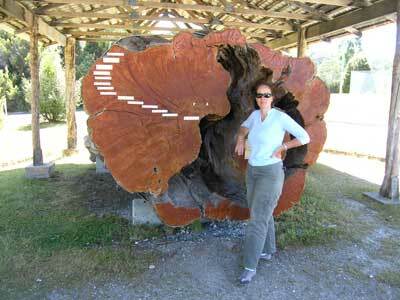 We go through the town of National Park (more about this tomorrow) and Maydena. Once in the state forest about 15 kilometres out of Maydena, we come across a very strange site. There are banners all over the place and placards about logging. A protesters' camp. Again, more tomorrow. When you come to the intersection with the road to the bottom of Lake Pedder, you can either continue straight ahead and go to Lake Gordon or go to the Lake Pedder camping areas. We are well ahead of schedule so we decide to go to Strathgordon and Lake Gordon. As it is such a nice day and we are in such a remote location, it seems wasted to not at least drive the distance to Strathgordon to see the Serpentine and Gordon dams. The huge Lake Pedder is actually dammed by three separate dams. The first is at the southern end to the west of where we plan to camp tonight. This rock fill wall dams the Huon River at Scotts Peak. The second major dam wall is right at the north-western corner of the dam and it blocks the Serpentine River just above where it meets the Gordon River. This is pretty close to the dam wall for Lake Gordon. 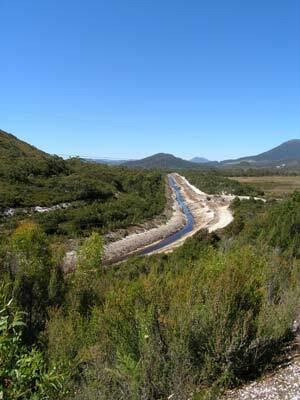 The third dam for Lake Pedder is a smaller one that closes a swampy area at Lake Edgar right next to where we are going to camp. 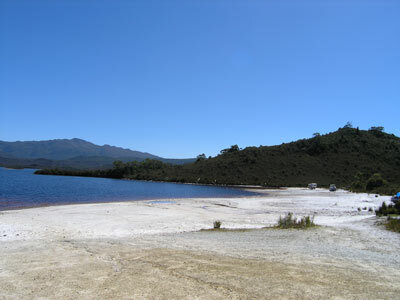 Lake Gordon is only a little larger in surface area than Lake Pedder (272 square kilometres) but holds more than three times the volume of water at 11,900 gigalitres (21.17 SydHarbs). 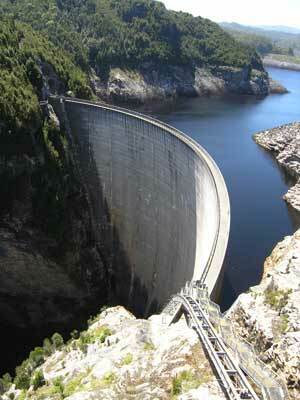 The dam wall is a large concrete wall built across the Gordon River just above where it meets the Serpentine River. 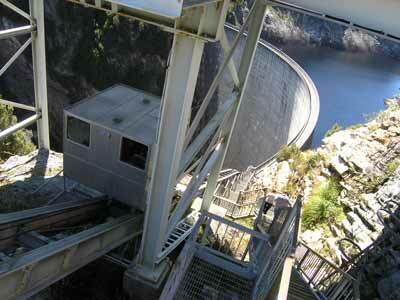 The Gordon Dam wall is 140 metres high. 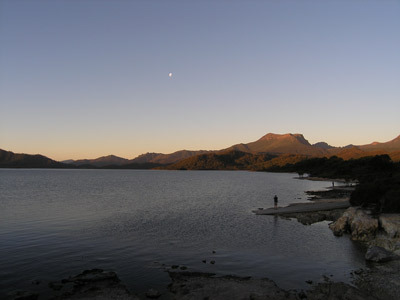 Lake Pedder covers an area of 242 square kilometres (equal to about 15.5 x 15.5 kilometres) and holds 3,300 gigalitres (equal to 5.87 SydHarbs). 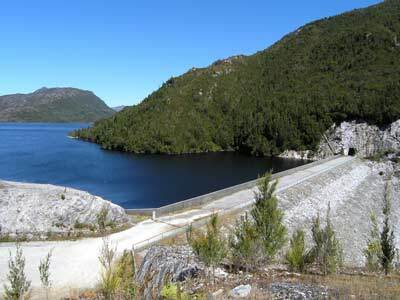 Water from Lake Pedder flows into Lake Gordon via the McPartlan Canal and is then used in generating electricity through the Gordon Dam hydro stations. The dam planning started in 1963 with the construction of the roads into the area and in 1967, the main planning of the dams began. The dams were completed in 1972. It is a good tar road to Strathgordon. On the way we see Teds Beach Camping Area (which does not permit open fires according to the NPWS web site). This is right on the water's edge but has little protection. 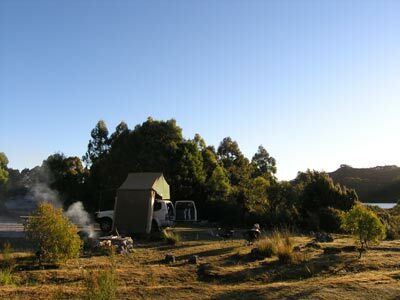 We have already decided that we would prefer to camp near Lake Pedder. We get to Strathgordon at 1:20 pm. This is the old construction town which was built for the construction of the dams. All that is left now are some of the worker accommodation (which is now accommodation for visitors) and the roads. We get some leaflets and continue on. There is a lookout just past here where we stop for lunch. At 1:40 pm we leave. It is 23ºC and sunny. We arrive at the Gordon Dam at 1:50 pm. This is a great engineering feat and it is very spectacular. You can walk down a series of stairs (198 steps Kelly reckons) to the dam and then across the dam itself. It is a hard climb up and down but worth it. We go and look at the inlet building for the underground power station. Apparently you used to be able to do tours, but for security reasons (terrorists here? ), these are no longer available. 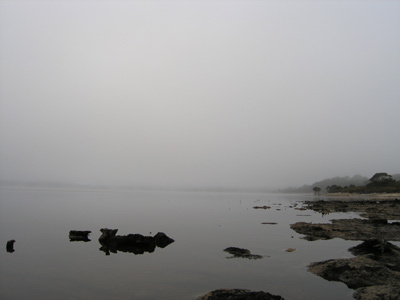 We go out to Serpentine Dam but there is not that much to see. We head back to the turn-off to Edgar Dam. This road is gravel but in good condition. 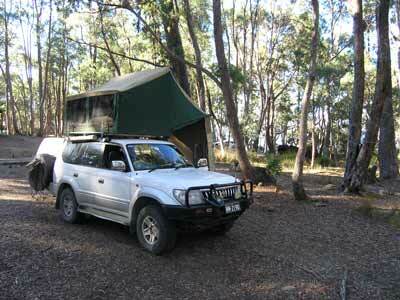 It is a bit over 36 kilometres to the end where there are a number of good campsites. There are more bee hives all along this road. I still cannot fathom bees still being permitted in national parks. Once we got to Edgar Bay, we had a quick look at the camping area. It is very nice. 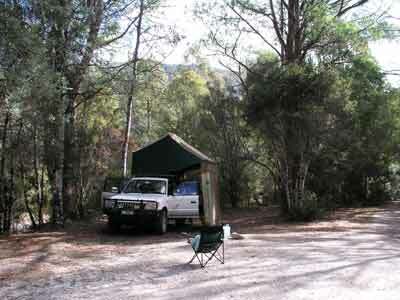 We drive out to the Scotts Peak Dam and look at the Huon Camping Area which is here. It is also nice, with about 10 mostly small spots under the trees, tables, toilets, fireplaces and wood but we decide to stay at the first camping area we came to, Edgar Camping Area. 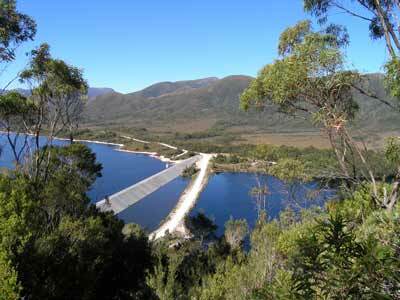 We head back and just before Edgar Dam, we drive and walk to a lookout that gives views over the dam and Lake Pedder. We arrive back at Edgar Camping Area at 4:30 pm. This is right on the edge of a smaller lake and is much larger and a bit more open. It has toilets, tables, water, shelter sheds, fireplaces (with a table) and even fire wood is provided (it is managed by Tasmania Hydro, not NPWS). We set up camp and I start a fire as we are having a baked dinner tonight and need some good coals. We sit and read and have a few beers and wines while watching the pademelons wander around the camp site. I put the roast beef and vegies on at 6:50 pm and it is cooked by 7:35 pm. Excellent dinner! After dinner we walk to the dam wall and take some shots of the sunset. We walk right across the dam wall and return via the roadway. There are a few people fishing for trout but none of them catch anything. Back at the campsite I make up my apple crusty pudding (this time with pineapple thrown in) and it takes 40 minutes to cook. We eat it and at 10:45 pm we go to bed. This is a very nice spot, probably one of, if not the, best camping areas either of us have ever stayed at. Today we have driven the longest distance of the trip (excluding to and from Melbourne) but it has not been overly tiring as most of the roads were good and you could sit on 80 kilometres per hour for most of it.